Combi has been designed to operate in the full range of environments from commercial premises through to heavy industrial applications which may require hazardous area sensing. Typical monitor locations are - public buildings, car parks, tunnels, breweries, boiler plant rooms, water treatment works, H&V control, manufacturing, process plants, horticulture, hotels, offices. Each gas sensor continuously monitors the atmosphere, reporting any hazardous conditions to the control unit, for display by the alpha numeric screen indicating the reporting sensor, gas type, concentration and alarm status. Alarm levels that are exceeded will automatically activate a variety of signal outputs including analogue/digital data and user selectable relays. The Combi system operates on a 4-core (addressable) or 2/3 core (direct) cable network and has the capacity to monitor up to 64 addressable and 16 direct sensors of various gas types. Larger systems offering unlimited sensors can be achieved using multiple combi units housed in a 19” rack based system. The Combi is supplied ready to use with pre-calibrated gas sensors and provides for additional sensors that can be easily added to any point of the network. Optional software (Combi Soft) allows full data logging facilities with system management providing real time views showing sensor locations, alarms status and actual gas values. Other optional featurse include a repeater panel, 64 additional relays and an addressable relay board. Other features of the Combi system include automatic safety check diagnostics/system surveillance and system management via remote access, on screen text description of sensor locations, event data logging (internal 99 event), low cost installation and one man calibration utilising peak readings. 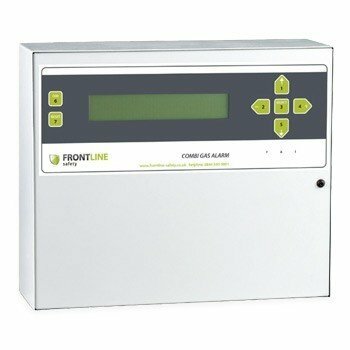 Frontline Safety were approached by an existing customer to provide an adaptable solution for the provision of a fire and gas detection system within a modular building being used within a third parties premises. The fire and gas detection system comprised of integrated (non-addressable) fire alarm panel and a Combi gas detection panel. General alarm relay - resetable S.P.C.O. - for sounders etc. Combi Soft - full data logging and management tool - option.